ChemTHEATRE is the database which stores scattered, existing text data or excel data in the same style and keeps the data well organized. It can provide you useful information more systematically than ever! Each dataset is attached metadata on experimental methods, which are criteria to judge accuracy and reliability of the analyzed data. It is also attached metadata on biological specimen. These metadata can help you reach the measured data easily by searching by keywords in the metadata. Instrument group, Name of instrument, Extraction method, Clean-up method, etc. Collection date, Country, Area, Latitude and Longitude, Scientific name, NCBI taxonomy ID (by reference to NCBI external database), Tissue, etc. 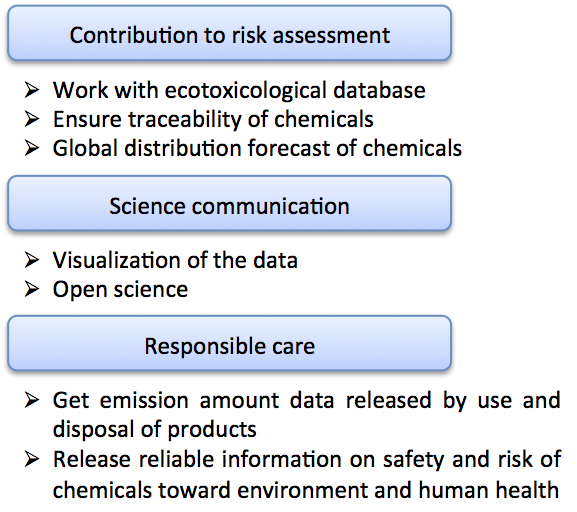 ChemTHEATRE ensures traceability of chemicals and helps you simulate the environmental behavior and fate or assess the risk. It offers the following advantages in cooperation with external database or other tools. Accessible research achievement in the forms of environmental education and open science (the advanced information visualization). 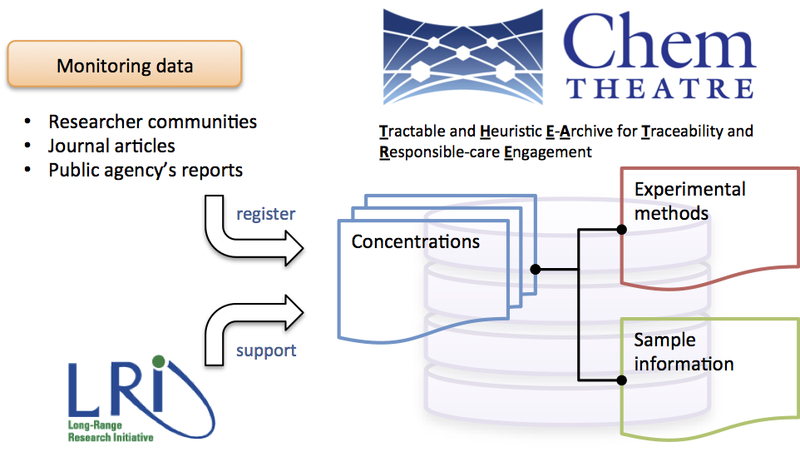 ChemTHEATRE is very active in working together with other databases in order to meet the concept of responsible care. By using ChemTHEATRE, you can save time, labor and cost to collect the huge data for risk assessments and can conduct assessments more easily than ever. Since ChemTHEATRE provide actual chemical concentration, you can conduct chemical exposure assessments and ecological risk assessments by using actual measured values. ChemTHEATRE will continue to store and play a role in providing information on safety and risk of chemicals.